The point is that for over twenty years reputable scientists have tried to open a debate on the very serious military implications of the antimatter research carried out at CERN and at similar laboratories around the world. This has led to a whole series of technical-level publications, mostly in scientific journals, as well as to a number of papers in leading journals such as The New York Times (Huge production of antimatter planned, 27 August 1985, p. C1 and C3) and Nature (Antimatter underestimated, 26 February 1987, p. 754), which however have received very little attention. Concerning Dan Brown's book, as well as CERN's reply to it, there are numerous (technical and political) mistakes in both. In particular, the most important technical mistake is to suggest that large quantities of antimatter are needed to make a very powerful bomb: this is wrong. As is explained below, and confirmed by numerous professional publications (see three recent ones at the end of this Web page), tiny amounts of antiprotons are sufficient to initiate huge thermonuclear explosions. Indeed, on the order of one microgram of antiprotons (or antihydrogen) is enough to trigger a multi-ton or multi-kiloton thermonuclear explosion! At CERN (the European Laboratory for Particle Physics), on the evening of the 17 to the 18 of July 1986, antimatter was captured in an electromagnetic trap for the first time in history. Due to the relatively precarious conditions of this first successful attempt, it was only possible to conserve the antiprotons for about ten minutes. This was, nevertheless, much longer than the Americans Bill Kells of Fermilab and Gerald Gabrielse of the University of Washington had hoped for. When these researchers return to CERN for another attempt, an improved apparatus will permit them to literally 'bottle' several tens or hundreds of antiprotons. Ultimately, the perfection of this technique will allow them to carry home a substance infinitely more rare and difficult to obtain than a piece of the Moon. They would thus be able to complete, in their own laboratory, a most important experiment for the theory of the unification of the fundamental physical forces, that of comparing, with a precision greater than one part per billion, the masses of the proton and antiproton. They will, as the group from the University of Washington, strive to divulge the difference in mass between the proton and its antiparticle. But, they will also attempt a number of complex manipulations such as, the production of antihydrogen, the injection of antiprotons into superfluid helium, the search for metastable states in ordinary matter, etc. Various crucial experiments that should, in the near future, help to determine whether or not antimatter could become a new source of nuclear energy for civilian and military applications. For the more delicate experiments, they could certainly bring their vintage 1987 or 1988 bottles of antimatter to Los Alamos. There, up in the peaceful mountains of New Mexico, they could perfect nuclear weapons free of radioactive fall-out, beam weapons projecting thermonuclear plasma jets, gamma- or X-ray lasers, or other still more secret weapons, all triggered by antimatter. Paradoxically, as futuristic and revolutionary as these weapons may seem, the military importance of antimatter , provided it can be produced, is as old as the science-fiction that has been talking about it. For instance, it is quite possible that Edward Teller, the father of the American H-bomb, already had ideas of eventual military applications when he published in 1947, with Enrico Fermi, an article treating the capture of negative particles heavier than electrons by matter . It is just as significant to notice that since 1945, about half of Teller's non-classified publications and many articles published by Andrei Sakarov, the father of the Soviet H-bomb, are concerned in one way or another with antimatter. In fact, in 1950, two years before the explosion of the first H-bomb, the ignition by antimatter of a mixture of deuterium and tritium was already being studied. However, as shown for example in an article by A.S. Wightman  (studying specifically the problem of the capture of antiprotons by deuterium and tritium), or in an article by J. Ashkin, T. Auerbach and R. Marschak  (trying to calculate the result of the interaction between an antiproton and a nucleus of ordinary matter), the major problem at that time was that there wasn't any experimental data on which one could make a precise prediction of what would happen, for example, when a proton and antiproton met. Nevertheless, well founded theoretical arguments already permitted a good understanding of the two essential characteristics of such a so-called annihilation reaction, a reaction in which the masses of a particle and its antiparticle are totally transformed into energy. These two characteristics are still valid today and entirely justify the interest in antimatter. The first, is that the release of usable energy per unit mass is greater in annihilation than in any other nuclear reaction. One proton-antiproton annihilation releases 300 times more energy than a fission or fusion reaction. The second, is that when antimatter is brought in the proximity of matter, annihilation starts by itself, without the need of a critical mass as in fission, and without the ignition energy needed in fusion. In short, an ideal nuclear trigger, provided that methods to produce and manipulate sufficient quantities of antimatter be found. But, at that time, the how and when antimatter could be produced wasn't known, and a number of fundamental questions about annihilation were still outstanding. Consequently, for several years, applied research concentrated on more promising near term techniques, though less elegant for the theoreticians. Thus the problem of igniting the H-bomb was resolved by using an A-bomb as a trigger, and the existence of the antiproton remained theoretical until 1955. Historically, the first antiparticle ever observed was the antielectron, also called positron. It was discovered in 1932 by Carl David Anderson, who while observing cosmic radiation, noticed a particle of the same mass as the electron, but of opposite charge. Evidently many attempts were made to discover the antiproton, using the same method, but without success. With the detectors available at that time and knowing only its mass and electrical charge, it was practically impossible to identify with any certitude the antiproton within the cosmic radiation. It had to be artificially produced. For that an accelerator, much more powerful than anything built up until that time, was needed. Briefly, this is how antimatter is produced: protons are accelerated close to the speed of light, and then projected at a target. The ensuing collision is so violent, that part of the energy is transformed into particle-antiparticle pairs. Once this accelerator was built in 1955 at Berkeley, antiprotons were "seen" for the first time. By injecting them into a liquid hydrogen filled detector, the energy liberated in the explosive encounter of an antiproton and a proton, was seen to rematerialize into a scatter of other particles, essentially pions, shooting off in all directions, and carrying away with them most of the annihilation energy. But Edward Teller and his student Hans-Peter Duerr didn't stop there . In 1956, they forwarded a hypothesis: If instead of annihilating with a simple hydrogen nucleus, the antiproton annihilated with a proton or neutron situated in the heart of a complex atom, such as carbon or uranium, the nucleus in question would literally explode. This would result in a very large local energy deposition, thus bringing to light again, in theory, many civilian and military applications of antimatter. Thirty years passed by before the complex of machines necessary to accumulate and slow down antiprotons was conceived. The only system of this type in the world  is at CERN (Fig.1). Antiprotons produced at CERN can be ``bottled'' in a Penning trap, and sent by surface or air mail to an industrial or military laboratory. 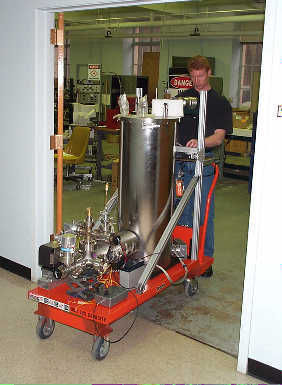 The largest component in this "bottle'' is a liquid-nitrogen Dewar required to cool the Penning trap itself, located at the bottom of the equipment, at the height of the antiprotons's injection/extraction system. Finally, it was possible to study, on a large scale, the meeting of antiprotons with nuclei. As a result, it has been possible to demonstrate that the energy deposition, although less than Teller (or others more recently ) had hoped for, is sufficient to assure the feasibility of military applications of antimatter. On the other hand, due to its very high cost and the enormous amount of energy needed to produce it, it has also become clear that antimatter could never become a usable source of energy for a power-plant. Thanks to the results of CERN, we were able to publish in August 1985, an estimation of the number of antiprotons needed to start thermonuclear reactions, be it to ignite an H-bomb or to trigger the micro-explosion of a thermonuclear fuel pellet . We thus discovered that it is possible to build a H-bomb, or a neutron bomb, in which the three to five kg of plutonium are replaced by one microgram of antihydrogen. 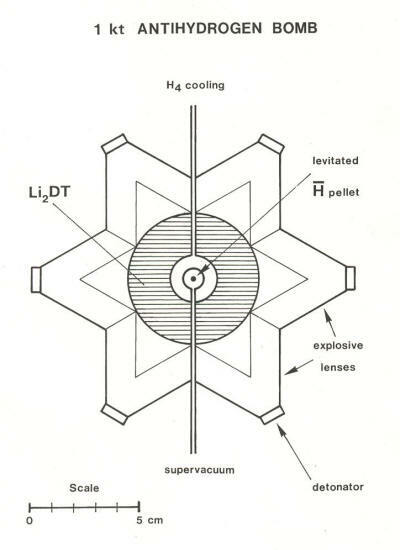 The result would be a bomb so-called "clean" by the militaries, i.e., a weapon practically free of radioactive fall-out, because of the absence of fissile materials (Fig.2). It is possible to construct a thermonuclear weapon in which the three to four kilograms of plutonium, necessary for the ignition, are replaced by one microgram of antihydrogen. In this hypothetical bomb, the antimatter is in the center in the form of a pellet a tenth of a mm in diameter. It is surrounded by, and isolated from, the thermonuclear fuel (a 100 g hollow sphere of Li2DT). After compression by explosive lenses, the fuel comes into contact with the antihydrogen. Annihilation reactions start spontaneously, providing the energy to ignite the thermonuclear fuel. If the chosen degree of compression is high, a bomb with increased mechanical effects is obtained, and if it is low, a neutron bomb (see La Recherche September 1983). In both cases the electromagnetic pulse effect and the radioactive fall-out are substantially lower than that of a conventional A- or H-bomb of the same yield (1 kt). This corresponds to a minimum production rate of 1013 antiprotons per second, six orders of magnitude higher than that at CERN today (107 antiprotons per second). But, in theory, there exist numerous ways to increase this rate . What we were unaware of, was that since the summer of 1983, the RAND Corporation had been carrying out a study for the U.S. Air Force, "examining the possibilities for exploiting the high energy release from matter-antimatter annihilation" . Similar concerns had equally sprouted-up in the Soviet Union . The RAND study was completed in 1984. The version published in 1985 constitutes a serious evaluation of the development possibilities of such an undertaking, in view of military applications. According to this document, a definitive evaluation of the possibility to produce and manipulate 1013 antiprotons per second, and the construction of transportable antiproton reservoirs, should be realized within the next five to seven years; many important technological problems being able to be studied with ordinary particles instead of antiprotons. the release of energy in a matter-antimatter explosion is extremely fast (ten to a thousand times shorter than a nuclear explosion), and most of the energy is emitted in the form of very energetic light charged particles (the energy to mass ratio of the pions emitted in annihilation is two thousand times higher than the corresponding ratio for the fission or fusion reaction products). With the help of magnetic fields, very intense pion beams can be created, to the order of 100 mega-amperes per microgram of antiprotons. Such beams, if directed along the axis of an adequate device, can drive a magneto-hydrodynamic generator, generate a beam of electromagnetic waves, trigger a cylindrical thermonuclear explosion, or pump a powerful X-ray laser. In the last case, for example, the pions' energy could be used to transform in a very uniform plasma, a long cylinder of a substance such as selenium, whose ionized atoms have excited states favorable to the spontaneous emission and amplification of coherent X-rays. But this is only one of the many concepts that permit, thanks to antimatter, to conceive X-ray lasers having efficiencies ten to a thousand times higher than those pumped by any other known energy sources. A certain number of experiments, that can only be carried-out with antimatter, are necessary to perfect these applications. As long as antiprotons made in Europe (on Swiss Territory), could be bottled and brought back to the United States, the RAND Corporation concludes that a production/accumulation facility, such as the one at CERN, although desirable, wouldn't in the near future have to be built in the United States . Fundamental research or military research? In view of its considerable strategic potential (for instance, antimatter seems to be a particularly interesting pump source for the Star War's X-ray lasers), it's not at all surprising that Soviet and American Scientists interested by the eventual applications of antimatter are eager to come to CERN, which at present has at least a five year lead in antimatter technology. In effect, for the teams of American physicists coming from weapons laboratories, the official justification for their coming to CERN, is to carry-out fundamental research, pure scientific research. In the beginning of July 1986, these same Americans were supposed to go to Madrid, where a full session of the Fourth International Conference on Emerging Nuclear Systems was dedicated to antimatter energy concepts. At this same conference we were to present the point of view that the only realistic applications for annihilation energy were in the military domain . To everyone's surprise, the Americans didn't come. Ten days before the conference, they announced their withdrawal without giving any convincing explanations. The participants quickly realized that the American Authorities had undoubtly reevaluated the military importance of antimatter, and had probably prevented the Los Alamos Scientists from coming to Madrid . Thus exposing that scientists working at CERN, and coming from a non-European weapons laboratory, had other than fundamental research interests, that were obviously militarily sensitive. Whether antimatter triggered thermonuclear weapons are realizable or not, or whether other weapons using annihilation energy are feasible or not, the fact that a relatively small quantity of antimatter can set off a very powerful thermonuclear explosion creates serious problems for the future of the strategic balance. In fact, the arms control treaties presently in force deal only with fission related devices and materials : atomic bombs, nuclear reactors and fissile materials. By removing the fission fuse from thermonuclear weapons, antimatter triggered H-bombs and neutron bombs could be constructed freely by any country possessing the capacity, and be placed anywhere, including outer-space. Then again, even if technical obstacles prevented, for example, the actual construction of battle-field antimatter weapons, antimatter triggered micro-explosions would still allow small and middle sized thermonuclear explosions to be made in the laboratory. This possibility would considerably reduce the need for underground nuclear explosions, thus rendering ineffective any attempt to slow the arms race by an eventual comprehensive nuclear test-ban treaty . A nuclear test laboratory of this type could be based around a large heavy-ion accelerator , which would provide a means of massive antimatter production, as well as a driver to study the compression and explosion of thermonuclear fuel pellets. C. Deutsch: Inertial confinement fusion driven by intense ion beams. Annales de Physique 11 (Février 1986) 1--111. Relativistic quantum theory predicts the existence of two types of elementary particles appearing on an equal footing with respect to the fundamental equations. Thus, for each particle there exists an antiparticle having the same mass and spin but opposite electrical charge. Furthermore, particles and antiparticles can appear or disappear in pairs, due to the transformation of energy into matter and vice-versa. Antiprotons and positrons are probably the only forms of antimatter that will be able to be fabricated, in substantial quantities, in the near future. They are produced by accelerating protons (or other particles) to energies such that, when they collide with a target, a part of the energy is transformed into particle-antiparticle pairs. In practice, when using a fixed target, as a function of invested energy, the maximum antiproton production yield occurs when the protons are accelerated to an energy of about 120 Gev. Since less than one collision out of thirty produces an antiproton, and since the mass of an antiproton corresponds to only 0.94 GeV, the energy efficiency is very poor. From this point of view, a better solution would be to use a collider-ring in which the antiprotons would be produced by the head-on collisions of protons turning in opposite directions. In theory, an even higher yield could be obtained if conditions similar to the original "Big Bang" could be recreated in the laboratory, conditions in which proton-antiproton production becomes spontaneous. Such conditions might be found in quark-gluon plasmas, which could be produced in high-energy heavy-ion collisions, which are presently the subject of intense research [C]. Once the antiprotons are created (with a whole spectrum of velocities and directions), the following step consists of capturing them before they interact with matter. This is a problem much more difficult to resolve than that of production. It took almost thirty years before a solution was found at CERN. This required the invention of "stochastic cooling", a technique to decrease the width of the antiproton velocity distribution (see La Recherche April 1984 p.508-511). It is then possible to concentrate the collected antiprotons into a very small beam, to accumulate them in storage rings, and finally slow them down to energies such that they can be brought to a standstill in electromagnetic traps. In a Penning trap, particles are radially confined by a magnetic field, and axially by an electrostatic field. A cylindrical trap of this type served as host during the recent experiments at CERN in which antiprotons were bottled for the first time. It also trapped continuously a single electron for more than ten months at the University of Washington. To store antiprotons for years, one needs a vacuum better than 10-18 torr. This is obtainable only in enclosures that are sealed (after filling) and cooled to the temperature of liquid helium. It is therefore practically impossible to measure the vacuum level, so that doing the experiment itself is the only way to verify the technique. If this method is successful, it will be possible to make transportable bottles with a capacity of 1012 to 1013 antiprotons [E]. Then the decisive stage for the practical applications of antimatter will begin: will it be possible to develop adequate simple and compact storage techniques? For this, two major approaches are being considered. The first consists of making antihydrogen by combining antiprotons with positrons, and then trying to form solid antihydrogen pellets which could be stored and manipulated with the help of various electromagnetic and optical levitation techniques. Very high storage densities would be obtained, but only in cryogenic enclosures and extremely good vacuums. The most appealing approach would be to store the antiprotons in ordinary matter. In fact, if all antimatter particles have a tendency to spontaneously annihilate when coming into contact with matter (be it the effects of electromagnetic attraction in the case of positrons and antiprotons, or van der Waals forces for antihydrogen), the existence of metastable states of antiprotons in condensed matter can not be ruled out a priori [F]. For example, if a very low energy antihydrogen atom is diffused into a solid, it moves about until its positron annihilates with an electron. The antiproton may then take the place of this electron, and under some conditions, remain confined at certain points within the crystalline structure. At present the kind of substance to be used isn't known, but an enormous variety of chemical compounds and crystal types are available for the search of an optimum material. Other less obvious solutions could still be discovered. For example, antiprotons might, as electrons do when placed in liquid helium, form a bubble at the center of which they could subsist indefinitely [F]. Also, similar to the electron pairs responsible for superconductivity, antiprotons might possibly form Cooper pairs if placed in a metal, becoming thereby unable to lose kinetic energy by shock, and thus to annihilate. [A] A. Gsponer and J.-P. Hurni: Antimatter induced fusion and thermonuclear explosions. Atomkernenergie--Kerntechnik 49 (1987) 198--203. [B] G. Chapeline and R. Moir: Some thoughts on the production of muons for fusion catalysis. LLNL Report UCRL-93611 submitted to Journal of Fusion Energy (January 15, 1986). [C] T.A. DeGrand: Are antibaryons a signal for phase transition in ultrarelativistic nucleus-nucleus collisions? Phys. Rev. D30 (1984) 2001--2004. [D] G. Gabrielse, H. Dehmelt and W. Kells: Observation of cyclotron motion of a single electron. Phys.Rev.Lett. 54 (1985) 537--539. [E] W. Kells: Remote antiproton sources. IEEE Trans. Nucl. Sci. NS-32 (1985) 1770--1772. [F] M.V. Hynes: Physics with low temperature antiprotons. in Physics in the ACOL era with low-energy cooled antiprotons, Editions Frontières, Gif-sur-Yvette, France (1985) 657--664. Les armes à antimatière, La Recherche /17/ (Paris, 1986) 1440--1443. Antimatter weapons, The World Scientist (New Delhi, India, 1987) 74--77. Antimatter weapons, Bulletin of Peace Proposals /19/ (Oslo,1988) 444--450. Antimateria-aseet, in Antimateria-aseet (Kanssainvälinen rauhantutkimuslaitos, Helsinki, 1990, ISBN 951-9193-22-7) 7--18.